I do believe he has altered the landscape in a good way. He has brought intelligence, rationality and a decency to the Presidency that the world has needed for a long time. 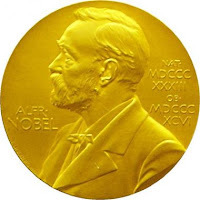 The Nobel, I suppose, is to help keep us on our current trajectory, one that the world needs. In this respect I have no problem with Obama being awarded the Nobel. It just seems a tad undeserved premature. Alan Grayson: "I Will NOT Apologize"